Janet (Kristen Scott Thomas) is throwing a dinner party to mark her appointment as a shadow minister. However, as old friends arrive to celebrate, she gets far more than she ever bargained for as relationships are tested and dark secrets revealed. Cinema has more than its fair share of awkward dinner parties. 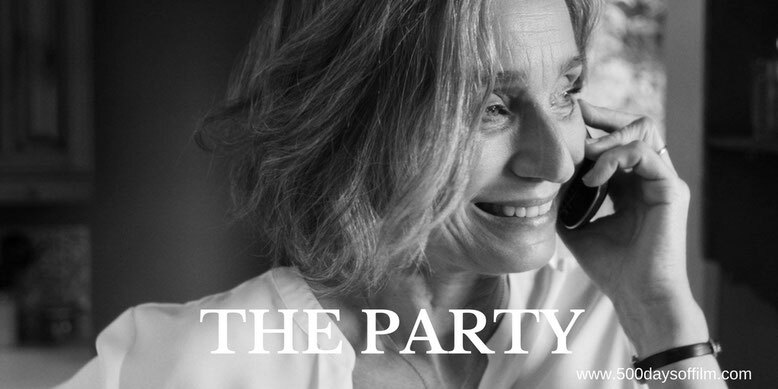 However, few are as nightmarish as that depicted in Sally Potter’s smart satire, The Party. In this short, sharp movie (it boasts a brisk 71 minute running time) Potter dissects the middle classes - revealing layers of unbearable (and often ridiculous) angst. Shot by Aleksei Rodionov in glorious black and white (the lighting in this film is simply stunning), The Party is chaotic and claustrophobic - as brittle as a burnt canapé. The action takes place in one location - at the house of Janet (superbly portrayed by Kristen Scott Thomas) and her troubled husband, Bill (expertly played by Timothy Spall). Janet is throwing an intimate dinner party to celebrate her appointment as shadow minister (of an unspecified political party) and, as her friend April (Patricia Clarkson) remarks, “proving she can still rustle up a canape in the kitchen when necessary, despite her political prowess”. However, from the film’s startling first shot, we know that something is about to go very, very wrong. Janet and Bill’s guests certainly come with baggage. April wants to separate from her new age partner, Gottfried (Bruno Ganz), Martha (Cherry Jones) and Jinny (Emily Mortimer) are struggling with the prospect of parenthood and Cillian Murphy’s Tom is, well, extremely disturbed to put it mildly. Over the course of the film, we find out what is troubling all of the guests - and the dark secrets that they harbour. The Party’s hugely impressive cast is a joy to watch - all actors are at the top of their game. However, largely thanks to Sally Potter’s brilliantly barbed screenplay, Patricia Clarkson steals the show. She gets so many wonderful one-liners (“You're a first class lesbian and a second rate thinker. Must be all those women's studies”) and they come thick and fast. Sadly, not all of The Party’s comedic elements land successfully. It is hard to appreciate the dry humour amid such unpleasant scenes of intensity and chaos. At times, the conflict between all of the characters (none of whom we are invited to like) threatens to overwhelm the film. Have you seen The Party? If you have, what did you think of Sally Potter’s film? Let me know in the comments section below of via Facebook or Twitter (@500DaysOfFilm).